6 feet tall, 200 lbs. wearing a tan hooded jacket, blue jeans, black sneakers and black gloves. 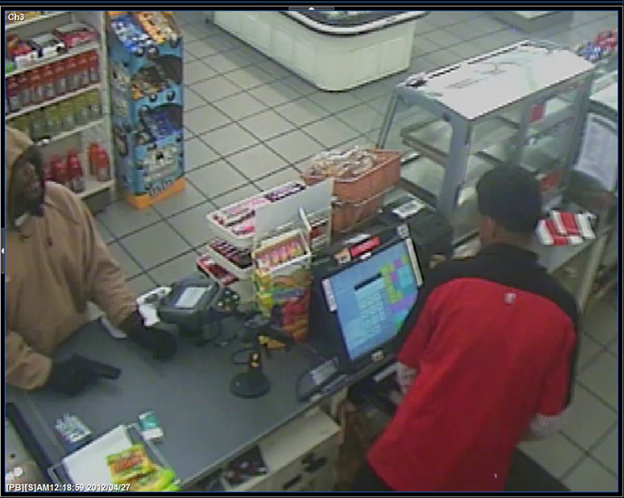 The suspect produced a black handgun, leaned over the counter and removed $315.00 dollars from the register. Suspect fled the area North on Linden Road towards Westfield Ave. in Roselle Park. Photographs of the suspect are attached. Since this incident the Roselle Police Department has increased patrols in the area. Additionally, Union County Crimestoppers is offering a reward of up to $5,000 for information that leads to the arrest and indictment of this suspect. Anonymous tips may be placed by calling (908) 654-TIPS or online atwww.uctip.org.